← Bright red dinnerware!! Lust Cats of the Gutters are media darlings!!! Going green and going up in flames. 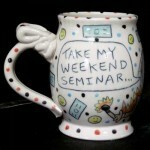 I came up with this new mug design idea last week on Earth Day. I’ve always felt that contemporary environmentalism is more about looking and feeling green than actually being green. Because to actually be green, you can’t take cool trips to Hawaii or live in a nice big house in the mountains like we do here in Evergreen. Yes, I suppose I am a bit of a curmudgeon and deserve to be run over by a Prius. 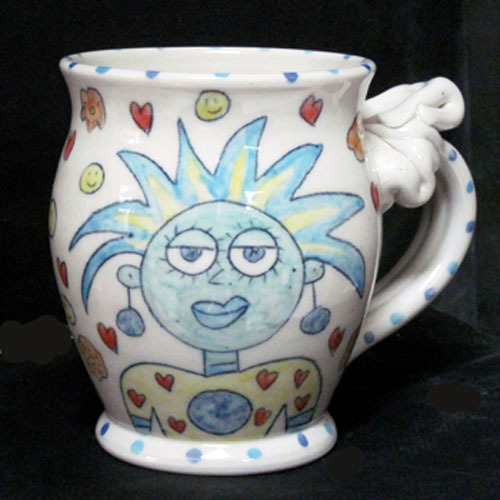 I should also disclose that this mug is an homage to my old friend and hero, Fred Babb. He’s been a longtime influence on my work and this one looks like something out of his 1995 “Friends and Relatives” calendar. Thanks for all the cosmic inspiration over the years, Fred! 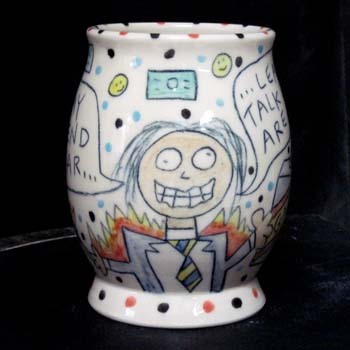 And here’s one more item in a long series of pots with flammable imagery. What’s up with that? 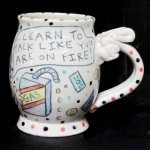 Why am I so compelled to make all these vessels with stuff burning on them? No, I wasn’t down by the old tire warehouse last week when it went up in flames…. really…. that wasn’t me…. I was home firing my kiln and it’s my airtight alibi. If you want to buy some of these hot and cool new items, just go to the online store. This entry was posted in Uncategorized and tagged art pottery, going green, man on fire, Tom Edwards. Bookmark the permalink. One Response to Going green and going up in flames.